unless the course of the regulatory-welfare state is reversed, a prolonged downward shift in the real rate of GDP growth is in the works — probably to about 2 percent. At that rate, expect a continuation of the present trend [since 2000] — stock-price “growth” [adjusted for inflation] of about -4 percent a year. Be sure to note the minus sign in front of the 4. From 1871 through 2010, the average annual increase in the value of the S&P Composite, with dividends reinvested, was 6.7 percent. This kind of hypothetical long-term “return” is cited often as a reason for buying and holding stocks. But a real return of 6.7 percent is not graven in stone, as the following chart indicates. Moreover, as a practical matter, the buy-hold-reinvest strategy would not work if there were a massive influx of stock-buyers intent on buying, holding, and reinvesting dividends. 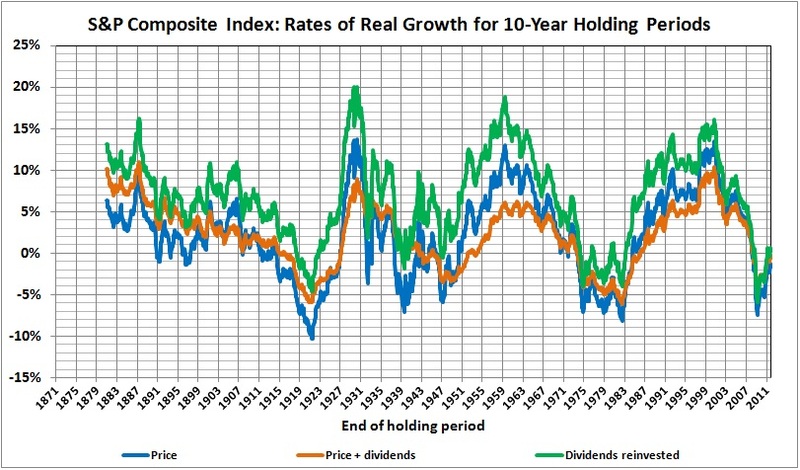 They would be chasing illusory returns because massive purchases of stocks would not be rewarded (quickly, at least) by proportionate increases in corporate earnings, which is the main driver of stock prices in the long run. The more likely result would be a bubble — like those of the late 1920s and late 1990s — which would burst, leading to lower stock prices and a greater reluctance to invest in stocks. 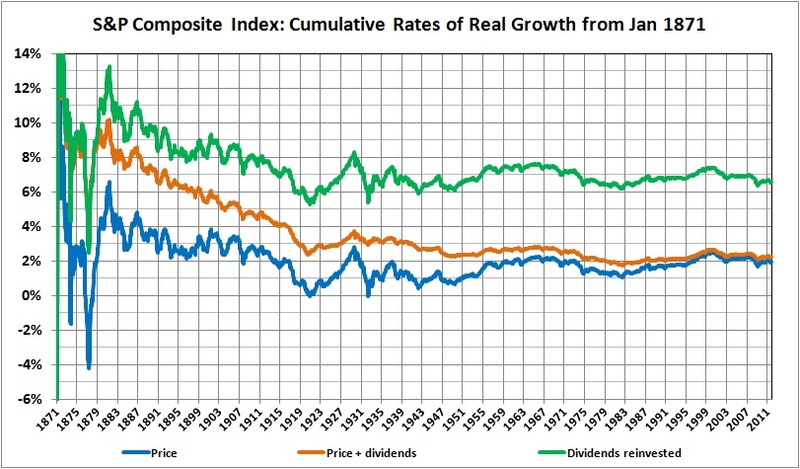 More realistic measures of expected returns from buying and holding stocks are depicted by the “price” and “price + dividends” lines. 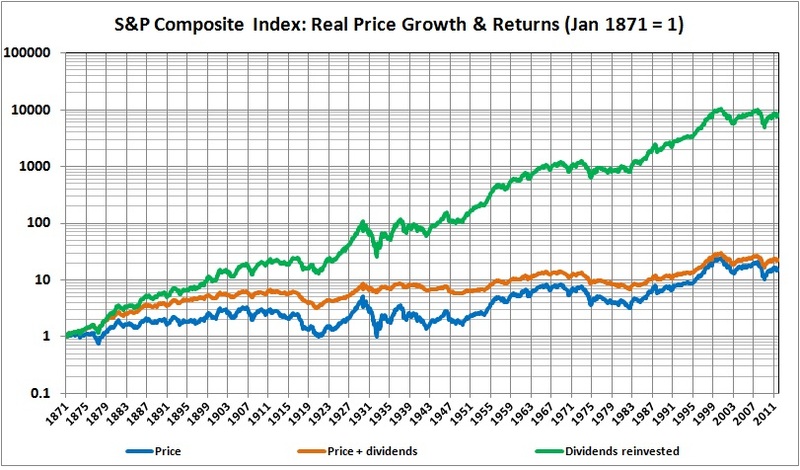 At the end of 2010, the average annual real return on the S&P Composite Index since 1871 was 2 percent. 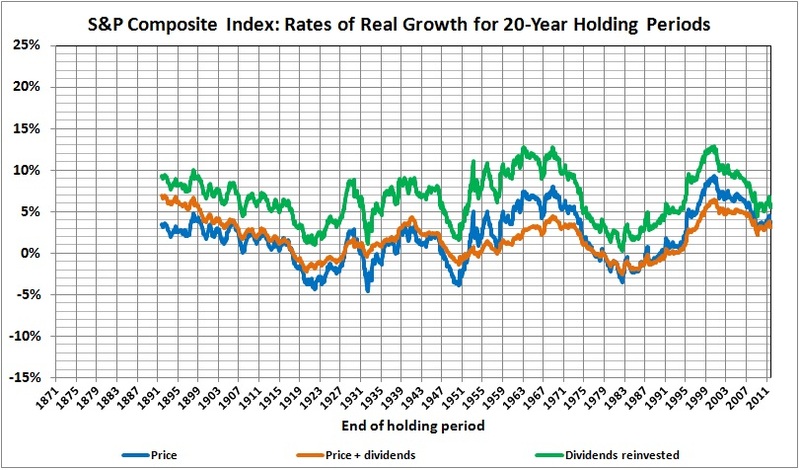 With dividends, the average annual real return was 2.3 percent. But almost no one — not even an institutional investor — is likely to hold stocks in the S&P Composite Index for 140 years. It makes sense, therefore, to consider shorter holding periods: 10, 20, and 30 years. 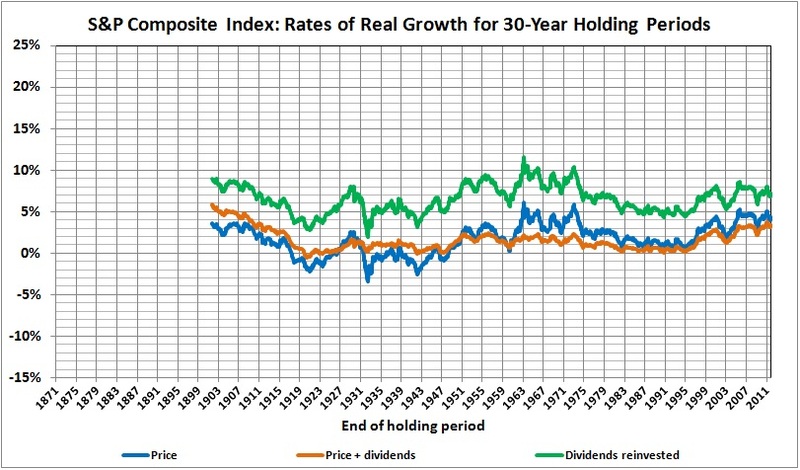 If history is any guide, consistently positive real returns on stocks are available only to the relatively rare investor who adheres doggedly to the buy-hold-reinvest strategy for 20 years or longer. But history is not a reliable guide because — unless the course of the regulatory-welfare state is reversed — the rate of GDP growth will continue to fall, and stock prices are likely to fall in sympathy. This entry was posted in Economics: Principles and Issues and tagged economic growth, stocks for the long run. Bookmark the permalink.